PULLMAN, Wash. – A Washington State University-led research team found households in rural Africa that vaccinate their cattle for East Coast fever increased their income and spent the additional money on food and education. Researchers also found that when fewer cattle died from the fever, girls were more likely to attend secondary school. 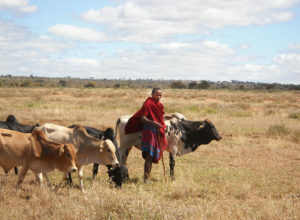 Published this week in the journal Science Advances (http://advances.sciencemag.org/content/2/12/e1601410), the study found that vaccinating increased a household’s income because fewer cattle died and disease free cattle produced more milk to feed the family or to be sold in the marketplace. “We need to think long term about the use of antibiotics and antibiotic resistance, as well as vaccines,” said Marsh. “If organizations are going to invest more money on vaccines, then besides the known effects – such as fewer cattle deaths – we need to understand the indirect effects. Co-authors on the study are Jonathan Yoder, WSU School of Economic Sciences and the Allen School; Tesfaye Deboch (deceased), WSU School of Economic Sciences; Terry McElwain, WSU Allen School; and Guy Palmer, WSU Allen School. The research was conducted with a grant from the Global Alliance for Livestock Veterinary Medicine and funded in part by the Bill & Melinda Gates Foundation.